So, you’re planning a hen party and never planned an event before? Well, have no fear! We’ve planned many hen party dance classes & events over the years and know what it takes to entertain a group of eager hens! 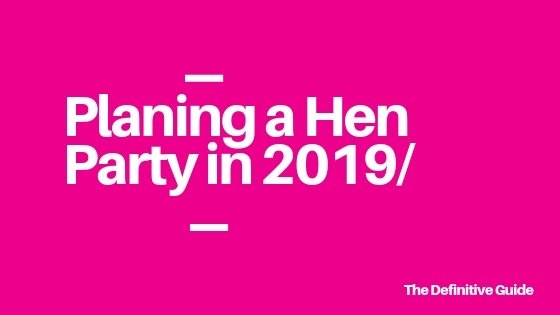 So, without further adieu…here is our guide to planning a hen party in 2019! Before we start, we advise you pop the kettle on, or in fact, get the wine out and we will take you through all the necessary stages of planning the perfect hen party. A party that will not be forgotten in a hurry! We know, we know! The hen party is all about ensuring that the bride has the time of her life, right? Well, yes you’re right – but remember, there are going to others in the group that you need to bear in mind also to make sure things all run smoothly! Either way, the initial research stage is the most important part of the hen party planning process. You need to make sure you cover all bases when hen party planning! So, in order to reduce the stress levels and not become overwhelmed during the hen party planning stages, here is a little tip! Download an app called Trello and document everything here! Dates, guestlist, confirmed hens, hen party activities, hotels, costs… everything! If you prefer to do things by hand, get yourself a nice ‘hen party notebook’ and start making lists of everything you need to figure out! Having it all in one place is super helpful. Before you start asking the other hens where they want to go, or what they want to do for the hen party you first need to establish a date. One thing to remember is to work the date around the school and bank holidays, as diaries can get filled up very fast over various holidays! Ask the bride first, it is her party after all! Once you have identified a few dates that would work best for the bride and the immediate family/friends you can then get to work on the hen party guestlist. Who should you invite on a Hen Party? Why not make a night of it? Invite some of the other bridesmaids around, get your best notebook out and make a list of all of the girls (and any boys!) you would like to invite to the hen party! Add all of the potential hen party attendees mobile numbers to your phone and set up a dedicated WhatsApp group! Now it’s time to start inviting! Send a mass message and get ready for the replies! Create a confirmed list on Trello (we told you it would come in handy) and when your confirmed list is finalised you are ready to move on to the next step. When planning a hen party, things can get way out of hand. So many amazing locations, hotels, activities, bars, restaurants and clubs! So, before you start planning set a budget per person per person. If you are staying local this should be relatively straightforward, however if you are planning on making a weekend of it there are other costs to take into consideration including travel & accommodation. Be clear about the budget from the beginning with everyone, and collect deposits for hen party activities as soon as possible – many activities require a deposit, and it’s also a great way to get a definite commitment for attendance! Decisions, decisions! the next step in the planning process is deciding on the hen party location. There are many popular hen party cities across the UK including the party capital Newcastle, the bright lights of London right through to the historic city of Edinburgh. Get some feedback from the bride and the other hens. If it is a night out then you need to look at options close to home, however, if the bride to be want’s a full-on hen party weekend then the options are endless! Well, as we specialise in hen party dance classes get prepared for a shameless plug right about now! Hens love dancing, we all do! So why not get the party started with a hen party dance class. We operate right across the UK and you can choose a range of dance classes including Dirty Dancing hen party dance classes, Disney, a little bit of Salsa or why not try a Beyonce Hen Party Dance Class! We have a range of dance packages for your hen party, so before proceeding go on and take a look! Think amazing venues, your own choreographer, bubbly, a gift bag for the bride packed full of hen party accessories, and a whole lot of fun! Pick a couple of activities you think the bride would enjoy most, and don’t try to cram too much in! Trying to squeeze too much in can add some stress on the day, and can stretch the budget a little tight. If you want to create a unique hen party that your hens won’t forget in a hurry, why not pick a hen party theme? Themes are a great way to keep your hens engaged, and they are great fun! They can also help you decide activities that can be related to your themes. Let your imagination run wild, hen parties are meant to be fun, and a hen theme is the perfect way to make yours stand out from the crowd! Whether you decide to go cheeky, silly, vintage or classy, just think of those amazing hen party pictures for you’ll come away with! In every city across the UK, you will find hotels that can accommodate large groups of hens over the course of the weekend! Bear in mind that if you are planning a hen party over a Bank Holiday or near a key date you will need to book well in advance to avoid disappointment. Many of the hotels will require a damage deposit so make sure all the other hens are aware of this and factor this into your budget. The last thing you want is a group of angry hens at the hotel reception! The clearer you can be about budgets and what everyone can expect, the better! If you get yourself organised in advance, it means you can really relax and really enjoy the day/weekend with your hens! Planning a hen party isn’t an easy task, but by using some of the information and tips above it will help you simplify the hen party planning process. By now you should have a list of potential locations, activities, theme ideas, travel and accommodation options. So, now it’s time to sit down, work out your costs together, get booked up and look forward to an unforgettable time with friends and family!